Volkswagen’s Black Beetle commercial has been given extra oomph on YouTube in a treatment similar to that of Nintendo’s Wario Land Shake. 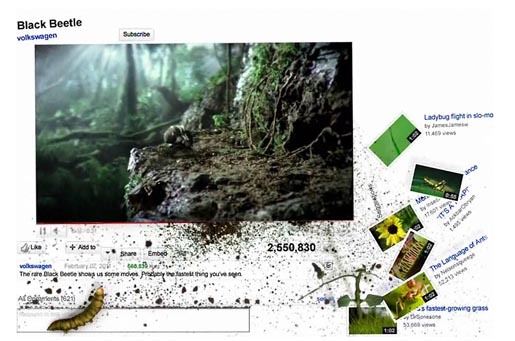 Online at youtube.com/blackbeetle, the rendition includes flying insects, grubs and flying dirt, all popping out of the screen and disturbing the video channel’s layout. Viewers are left with a choice of replaying the video, signing up for information on the New Century Beetle and other Volkswagen models, or spreading the word via Facebook, Twitter or MySpace. Filming for Beetle was shot by director Dante Ariola via MJZ with director of photography Fred Elmes, executive producer Jeff Scruton. Editor was Jim Haygood via Union Editorial, with executive producer Michael Raimondi. Post production was done at The Mill, London, by telecine artist Adam Scott, lead 3D artists Tim Bussell and Juan Brockhaus, lead 2D artist Barnsley, producer Gemma Smith, explosion artist Jon Spencer, producer Russell Simins. Sound was designed by Eddie Kim and Amber Tisue at 740 Sound Design with executive producer Scott Ganary. Audio post was produced at Eleven Sound by sound engineer Jeff Payne. See more on the making of the Black Beetle ad on Volkswagen at the Super Bowl.